"No significant impact" or "negligible" is the repetitive mantra of the Forest Service in their perfunctory "analysis" of their draconian measures limiting access to virtually all of our local wilderness. Poised for adoption in 2020, these restrictions may not have significant impact from their point of view; but they sure as heck have plenty of impact on me. Like many Sisters-area residents, the fact of my living here is not an accident; and access to our wonderful wilderness is a key part of what makes living here special. Apparently considered by the Forest Service to be a mere bureaucratic inconvenience, the proposed limited-access rules, in fact, constitute a catastrophic infringement of personal freedom that would fundamentally change my way of life. The Forest Service's 40-page decision document starts out with the scary proclamation that, "The most effective way to reduce recreation-related resource impacts would be to completely prohibit recreation in the project area." And, in fact, a careful analysis of the "analysis" lends the impression that this is exactly what the Forest Service would prefer. That way, the government would not have to be bothered with the troublesome burden of actually managing all those thousands of acres entrusted to them. 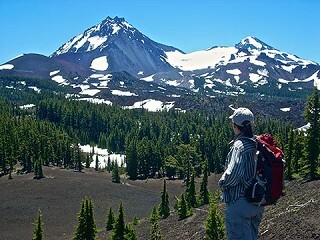 Unfortunately for that easy solution, the decision begrudgingly notes that "This approach would not be in alignment with the Wilderness Act," or, for that matter, the Forest Plan, which states, "Wilderness shall be made available for maximum public recreation use and enjoyment, consistent with resource preservation and maintenance of the wilderness environment." So, faced with being denied the easiest option of just closing the forest, the Forest Service seems to have seized upon the next closest thing. The decision states, "Alternative 4 Modified represents a restrained use of the management actions that were analyzed..." Selection of this option is nothing close to "restrained." More honestly, it is a very slightly modified extreme that still carries the bureaucratic effect of limiting wilderness use to such an extent that its management is no longer a bothersome issue. In truth, the Forest Service's own policy actually requires "the minimum actions necessary to preserve and enhance wilderness character." So then, what might constitute the "minimum actions necessary" rather than what some of us are privately calling the "nuclear option" that has been selected? First off, restricted entry should be limited ONLY to areas with demonstrable crowding and damage such as, for example, Green Lakes or Canyon Creek Meadows. The decision itself clearly concedes that many proposed closures include places that are "likely" to be affected or have "potential ... to become overrun in the future." There is no justifiable basis for restricting use of areas based on speculation. Secondly, I know from personal experience that many of the closures are in areas that are so lightly used that I rarely encounter anyone at all when hiking. Part of that, of course, is because I infrequently hike on weekends or holidays. So, if restrictions must be implemented, there is no logical reason to start off with sweeping restrictions that encompass every single day of the hiking season. It would be much more reasonable to start off with a more modest approach that requires reservations only on weekends (Friday to Sunday) and holidays. Also, the restrictions should end after Labor Day, not at the end of September. Only if these more reasonable measures prove ineffective, should the extreme blanket restrictions even be considered. Another action that doesn't seem to be even under consideration is actual enforcement of existing forest and wilderness rules. I have personally witnessed egregious violations - and reported them - only to be told that no wilderness ranger was available, even though other Forest Service personnel were on scene or nearby! The "proposed decision" falsely alleges that "a large number of the wilderness trailheads remain free with unlimited access for day use." It also makes the patently ridiculous excuse that only 0.5 percent of the U.S. Wilderness is impacted. If you live in Sisters Country, however, nearly 100 percent of your prime wilderness is impacted. I saw one alternative idea that would grant a sort of preferred status for local forest users to be able to enjoy the forest in their own backyards without special permits. That is certainly another option worth considering. In summary, it seems pretty obvious to me that the Forest Service made up their minds on this easy "fix" long before the proposed "options" were ever drafted. In this current governmental alternate reality of imagined crises and alternative facts, it is not surprising that such an autocratic solution would be proposed. This is not forest "management" but an abrogation of leadership. project=50578. Objections may also be mailed to Regional Forester, Objection Reviewing Officer, Pacific Northwest Region, USDA Forest Service, Attn: 1570 Appeals and Objections, PO Box 3623, Portland, OR 97208-3623. "Objections may also be emailed to the following email address: objections-pnw-regional- office@fs.fed.us. Objections may also be hand-delivered to the Pacific Northwest Regional Office, 1220 SW 3rd Avenue, Portland, OR, 97204. Hand deliveries can occur between 8:00 AM and 4:30 PM, Monday through Friday except legal holidays. Objections may also be faxed to: Regional Forester, Attn: 1570 Objections at 503-808-2339."